(Image source) Click to enlarge. Social media conversion – many of us are talking the talk, but do we really know what it means or how to achieve, and more importantly, measure it? If you’re wondering how to best use social media in your business, how to reach your customers better and how to measure what you’re doing, then you’ve come to the right place. This Slideshare presentation from Radian6 offers quick tips on identifying and participating in the online conversations your customers are having about your company to help them feel more connected to your brand. 2. Social Media Marketing: What’s The Point? Many small businesses may have social media accounts but they don’t have a social media marketing strategy. On Forbes, Lois Geller gives examples of companies getting it right – and wrong – with a reminder that the point of social media for business is winning and retaining customers. Social product promotion could form the bridge between liking a brand and buying something from the company, says Marko Z Muellner on the Smart Blog on Social Media. He outlines the benefits of creating ‘social microsites’ to enhance the customers’ experience and provide leads, engagement, conversion and insights for companies. Social media and SEO have the ultimate goal of improving your business and brand recognition, says this article on DreamGrow. It offers tips on making them play nicely together. Want some current stats on social media and SEO? This article from bravr provides interesting information on the changes in online platforms, social media metrics and how that can affect your strategy. Credibility is a key part of a good social media relationship with your customers, says Ocular Concepts. This article highlights ways to identify the audience, find out what they are looking for and build rapport for a targeted and effective marketing strategy. Consumers have a more sophisticated approach to social media use and consumption, says Chris Horton on Social Media Today. Online content is a key part of the engagement cycle and can help consumers make a decision to buy. POTUS has got it going on when it comes to social media marketing, says Eoin Keenan of Silicon Cloud. Well-timed, targeted content which is easy to understand and share makes for a compelling and successful strategy. Planning your social media marketing strategy for the year to come? Then you’ll need the heads-up on using social connections, extending your reach beyond Facebook and optimizing for a range of devices. That’s what Heidi Cohen offers in this article on the Clickz blog. 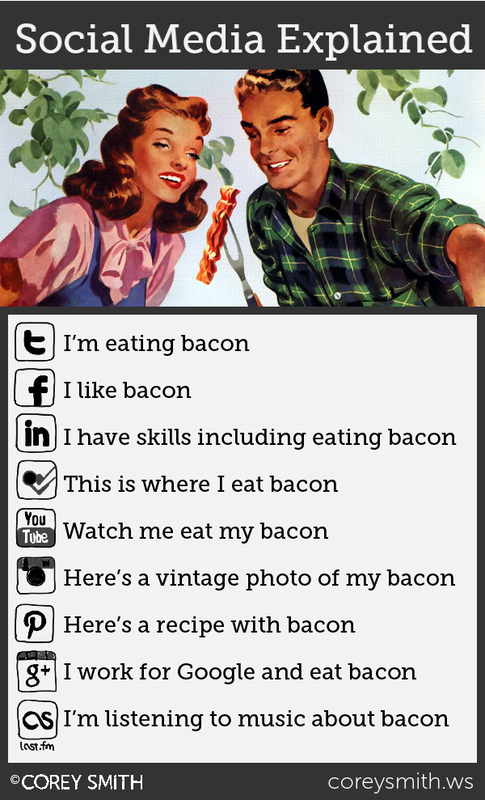 Need a social media strategy in a nutshell? That’s what you get with this infographic. Social Media Explorer’s Andrea Cook summarizes Nick Westergaard’s Time, Talent and Terror talk to give an at-a-glance approach. It may be infotainment, but it’s still useful. Lead generation is an essential part of the social media conversion mix, says Mike Wilton on Search Engine People. This article provides tips on finding out where your audience is, monitoring what’s happening and creating soft conversion opportunities that may eventually turn into leads. On Business2Community, Traian Neacsu shows how to get more traffic to your site with social media without having to spend a lot on advertising. While it takes time, creating shareable contents can be one of the best tools in your arsenal. Why have returns on social media investment failed to materialize for some companies? Marko Z Muellner of ShopIgniter outlines three issues facing digital marketing and e-commerce strategists that get in the way of finding measurable results. The problem with social media is that your pages belong to someone else, but you can still use them to build your network and increase conversion, says Brad Smith on Social Media Today. This article outlines three strategies to help you speed up the process. Unbounce writer Angela Stringfellow unlocks the mysteries of Facebook’s page post targeting. She explains what it’s all about and suggests ways that brand pages can use this new tool to improve conversions by making posts more relevant to users. When it comes to tracking social media conversion, it’s not only about completing a sale, says Julie of JHWebWorks. There are five other actions that visitors take that show that they are engaging with your site and brand. This article shows what they are and what they can tell your business. What do your customers really want? This post from KISSMetrics outlines some of the issues customers care about such as the quality of your service, easy to use loyalty programs and personalized interaction. There are some interesting stats with implications for your social media optimization efforts. Over on the Distilled blog, Cheri Percy weighs in on why metrics matter, the importance of picking a community as an initial focus and setting and measuring goals for social media interaction. There are some great infographics to illustrate this useful article. At Convince and Convert, Chris Sietsema delves into Google Analytics. He reminds us of some of the old reports and looks at recent additions to the Analytics suite, and tells us why we need to use these reports and, perhaps most importantly, where to find them in the revamped interface. You’re probably wondering what this post is doing in the metrics section. While Angie Schottmuller of Search Engine Watch is talking about strategy, this article is also about setting goals, defining and measuring your KPIs and using the right tactics to achieve those KPIs. Can taking pictures really lead to conversions? Social Media Today’s Jason A. Howie provides nine tips on marketing with Instagram as part of an overall social media strategy. Using your own hashtags, geo-tagging photos and encouraging engagement from your staff helps this be successful. Success with social media marketing means having the right tools. In an article on Practical E-Commerce, Paul Chaney highlights his favorites and says how they help with his marketing efforts. Google+ Hangouts are the killer feature of Google’s social network and they make a great business tool. This article by Lisa Barone on Small Business Trends suggests eight useful business applications for the tool. If you want to start using Pinterest effectively, then this post from our own Oli Gardner, which includes a useful infographic, gives you the 10 commandments to creating interest in your business via Pinterest. It includes ideas for creative promotion, plus useful tips and tools. How are other companies using social media? This post on the KISSMetrics blog gives examples of good practice and advice from companies who are getting it right. This last article just proves that there’s no single right way to convert with social media – there’s only the way that’s right for you.